Now in its ninth year, the Social Business Forum, Europe’s premier speaker and networking event dedicated to social business, will take place in Milan on the 6-7 July 2016. Organised by OpenKnowledge, the management consulting company focused on social and digital transformation, and held once again at the Marriott Hotel in the capital city of fashion and design, SBF16 will bring together features a unique offer of visionary keynote speeches, success stories and discussion panels organized in a Free and Premium Conference. The Free Conference includes the keynote speeches in the mornings of July 6th and 7th delivered by outstanding and internationally-known experts. 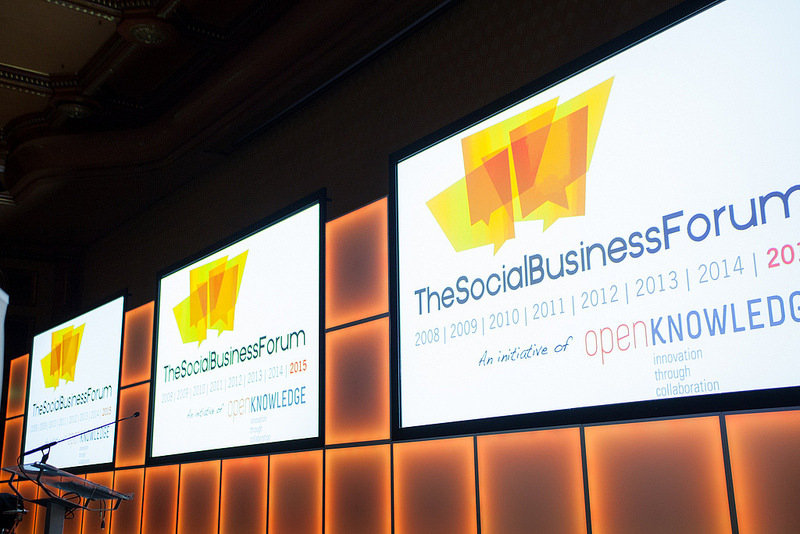 The theme of this year’s Social Business Forum is the Platfirm Age: Plug your Business – Play your Future. The focus of many of the keynote presentations will be on how platform-companies, such as Airbnb, Facebook and LinkedIn, have revolutionised traditional business models and developed continuously-evolving structures where value is co-created with users / customers. All the keynotes will be simultaneously translated by Interpret the Future, the Social Business Forum’s longstanding specialist interpreting partners. This year, the team includes ItF founder members Loredana Nano and Alice Bertinotti. Daniela Negru will also be in the booths helping the team to provide a highly professional conference interpreting service. The project is managed by Robert Dennis, director of Riverstone Language & Communications. Delegates at the Free Conference are invited to join the Open Lunch: lunch boxes will be offered during the lunch break. The Premium Conference includes all of the contents of the Free Conference plus several case studies and success stories on leveraging the platform logic for business (presented in the afternoons of the same two days by leading company representatives). This is a practical way to highlight how innovative projects and disruptive initiatives have become indispensable and have created value through new collaborative business models, practices and technologies. Delegates attending the Premium Conference will also have the opportunity to enjoy the Premium Networking Lunch: a unique chance to mix and discuss with international keynote speakers where you can network and develop your key business contacts. Premium Conference participants will be granted access to the Premium Networking Lunches on both days of the Forum (6 & 7 July). Attendees will be able to exchange ideas, create connections, and ask the Conference speakers any questions of their interest. It’s an easy way to see a potential business network at a glance, and foster future collaborations. VALERIO CAMERANO CEO A2A S.p.A.
Demand has been stronger than ever, but there are still some Forum places left, so if you haven’t already done so, hurry and register for the event! This entry was posted in Business Networking, Live Events, Riverstone News and tagged business, communications, Interpret the Future, interpreting, Marriott, Milan, Milano, projects, social business, Social Business Forum. Bookmark the permalink.